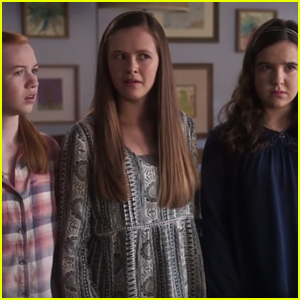 Abby Donnelly Photos, News, and Videos | Just Jared Jr.
'Just Add Magic' Gets New Season 3 Trailer - Watch Now! Just Add Magic has a brand-new trailer for season three! Amazon Prime Video released the new footage for the upcoming season on Friday (January 11). Just Add Magic tells the story of three friends who cook up spells to unlock the secrets and curses that befall their small town. Olivia Sanabia, Abby Donnelly, and Aubrey K. Miller star. Watch below, and don’t miss Just Add Magic when it premieres on February 1! 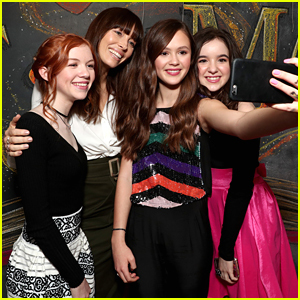 The cast of Amazon’s Just Add Magic snaps a super cute selfie with Jessica Biel at their season premiere event in Los Angeles on Saturday night (January 14). Aubrey Miller, Abby Donnelly, and Olivia Sanabia met up with the actress, who owns Au Fudge, the restaurant that hosted the event — as well as Albert Tsai, Gabe Eggerling, and Girl Meets World star August Maturo. All the families attending participated in a special kid’s cooking class, a private screening of season two of the Amazon Kids show, plus cake decorating, face-painting, and even nibbled on delectable menu items and desserts. FYI: Olivia wore a cute MSGM jumpsuit and Topshop shoes for the occasion. 'Just Add Magic' Star Shares Exclusive BTS Photo Diary For Season 2! We’re so excited that Amazon’s Just Add Magic is back today! In season 2, one of the book’s magical recipes brings back an enemy in Chuck Hankins, who disappeared as a teenager, and comes back seeking revenge. Now, Kelly, Hannah and Darbie must stop Chuck before he puts them in danger. Star Abby Donnelly, who plays Darbie, shared a super cute photo diary with JJJ aand we’re sharing it with YOU! Just Add Magic is streaming on Amazon Prime right now! Just Add Magic's Abby Donnelly Shares 10 Fun Facts With JJJ! Meet Just Add Magic actress Abby Donnelly! She’s 14 years old and stars in the hit Amazon Kids Series, which follows a group of friends who stumble upon a mysterious cookbook and discover its recipes are magical. Tune into Just Add Magic‘s new episodes starting January 13. 1. My favorite animal is a hippo. 2. I go to regular school when I have time. 3. I listen to Christmas music year-round. 4. My sport of choice is boxing. 5. I’m obsessed with Hamilton, the musical. 6. I love makeup, especially Too Faced. 7. I like to eat more than I like to cook or bake. 8. I have two cats. 10. I’m a fan of Gilmore Girls, Survivor, Grey’s Anatomy, and Buffy the Vampire Slayer.